The Matrix Impact 2 Electronic Pipettes provide an easy to use, programmable pipetting experience that is intuitive as a manual pipette. This digital pipette will store up to 5 pipetting programs each with up to 40 steps, as well as a scratch pad function for changes on the fly, for use that can be tailored to best and most effectively suit your needs. These multichannel pipettes are color coded for quick identification, and come in a variety of configurations, some fixed channel and some expandable. 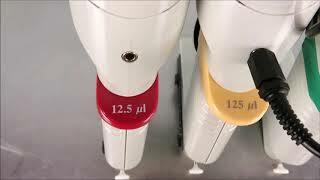 The electronic pipettes with the extendable range are simple to adjust, with a twist of the handle at the base, the spacing can move to fit nearly any plate or vessel to help boost efficiency. The digital key pad to the Matrix pipette is intuitive to read and program, and features a special function key, activated with a pipette tip, giving you access to more advanced options like pipette speed, paced dispensing, calibrations, and even adjusting the volume of alerts. These Thermo Matrix 2 Multi-channel pipettes have been fully inspected and are operating without issue. All of our lab equipment comes backed with our standard warranty. Please note, the stand in the photos are for picturing puproses and is NOT included. Should you have any questions, about this or any of our other pipette packages, please don't hesitate to contact us.